In today’s modern world, many brides make a custom wedding website as part of their preparations for the big day. 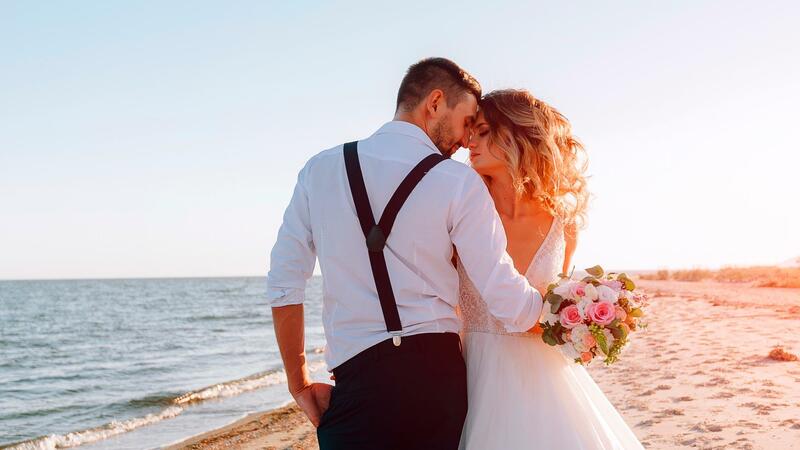 While it may sound like just a modern trend, the benefits of creating and sharing a wedding website have made the top free wedding planning websites household names in the wedding industry. Whether you’re planning an intimate ceremony or a lavish reception, selecting the best wedding website builder is important to streamline wedding planning. When you create a free wedding website, there are several advantages for both you and your guests. Perhaps the greatest is online RSVPs. As more and more communication goes online, so do wedding reservations. All wedding website templates will have a page for guests to confirm their reservation, let you know how many are coming, and request their dinner option, so you won’t have to worry about mail getting lost. Some wedding website ideas include having a comment area on the RSVP page for guests to put in a song request, which will guarantee a rocking dance floor for everyone. For brides and grooms, a free wedding website will compile all this information, making planning the ceremony and reception more organized and streamline. The top free wedding planning websites aren’t just about RSVPs. They’re a way for couples to share their love with family and friends. Most wedding website templates include a page for brides and grooms to write their love story for guests to read as they scroll through engagement photos and special memories. Some templates even include a page to tell about the wedding part and share with guests how important each person is to your story. Using these wedding website ideas will help set a tone of intimacy and love, and your guests will appreciate getting to know you and your partner a little more before the big day. Choosing to make a custom wedding website is also a simple way to communicate the logistics of your wedding day with guests, and since it’s all online, they won’t lose it like they might if it were just on paper. When you use wedding website templates, the site will prompt you to include the address of the venue, hotel options, and links to wedding registries. For guests, this free wedding website will be their central spot to go to as they plan to attend the wedding. The Knot has become the top online wedding planning resource and the best wedding website builder, full of wedding website ideas and inspiration. With over 160 modern templates to choose from, you can build your website with The Knot on your computer or with their all-in-one wedding planning app. As one of the top free wedding planning websites, it will coordinate your guest list, hotel deals, and registries to put all the information about your wedding at your fingertips. It’s an easy to use site and has been trusted by thousands of brides around the world. Using the Knot, one of the top free wedding planning websites, is easier than you might think. The first thing you need to do is visit their website, click on “Start Now,” select the design template that you like the most, enter some basic information, and then continue on to create a free wedding website. Make sure to register your free wedding website using your email address and a password that will keep all your information protected. The next steps include modifying the URL of your website to make it unique or leaving it as the default and choosing the dates of your wedding and the location. After you’ve saved the information, you can then choose between a few offers that come at an additional cost, such as wedding registries and destination wedding packages, before heading on to the panel that allows you to create the bulk of your personal content. These sections will tell your guests more about you as a couple, including your history together, information about your wedding, other events tied to the wedding, and information about the wedding party. You’ll also need to add a photo, which can be done by clicking on “Add Cover Photo” and uploading your favorite photograph. The site is considered one of the best wedding website builders because of all the additional information you can include. If you’re planning on having out of town guests at your wedding, it is important to make a custom wedding website that provides information about accommodations, things to do in your destination, and the plan for transporting guests to and from your wedding venue. The Knot wedding website planner has sections where you can include your accommodations or the resort where you are going to have your wedding. This is a great way to show your guests just what they can expect when they attend your wedding and the things they can do before and after your big day. Saving your information along the way is a great idea. You can also preview what your website will look like at any time by clicking on “Preview Website” at the top right hand corner of the screen. When your wedding website is 100% complete, you’re ready to share it with your guests. Today, most modern brides choose to create a free wedding website to communicate important information with guests and to streamline the process of planning a wedding. As you design your free wedding website, be sure to include personal touches through your story and photos. With the help of online wedding website builders, you can create a stunning page to set the tone of love and intimacy for your wedding day.